Before I begin: I get het up on media ethics. The media is capable of many things. First and foremost, it is a tool to send factual news from people to the masses. When facts aren’t clear-cut, however, we rely on the fully formed and carefully considered opinions of trained journalists. This is where problems can arise. I would say most, if not all, media outlets be them websites, newspapers, radio stations, television networks or whatever have their own agendas to push. The opinions given via these outlets are usually what shape us to read, listen to or watch certain outlets while ignoring others. It’s only natural that we read, see and what we want to, from people we broadly agree with. This is as much romourmongery as scaremongery but a good example of the health reporting shown by the paper. The Daily Express is no better (in fact, maybe a little worse) when it comes to health. A good example all round, this. Use of inverted commas, use of the words “believe” and “suspected”. The comments show the level of a standard Daily Mail reader. The only thing separating this paper from the Star, Mirror or Sun is the colour they print their masthead. If it’s what people want to read, what’s the problem? An easy thing to say, that. You can avoid media channels, as I was saying earlier. However, sometimes something happens that transcends your normal media viewing. The death of Dan Wheldon, British IndyCar driver, is one such thing. I’m a big motorsport fan and will happily read anything and everything about it, no matter where it comes from. I follow blogs and twitter feeds you’ve never heard of, I regularly buy Autosport magazine and am one of those funny people who get up a 5 in the morning on a weekend when the Formula One is in Japan. The Daily Mail have gone to town on his death. Described on Twitter as “gratuitous” and “a disgrace” by respected motorsport writers, I searched out the article on the Daily Mail website. Being a racing driver in an American series, I didn’t expect to see anything on the home page. However, it’s their main story of the day. Ok, there’s a grim fascination with car accidents – where do you think the phrase “Car Crash TV” came from? However, I’m very surprised that it’s their lead story unless they wanted to do something with the article. To put this into context, talkSPORT, the specialist sports radio station, had it as a main news item but no time within the show was dedicated to it. Admittedly, I think this may have been a little too far the other way but as they say, if you’ve got nothing nice to say, don’t say anything at all. Obviously this cannot be practiced when dealing with hard-hitting political news and suchlike, but when dealing with the sudden death of a professional sportsman, it might be worth it. Why was British driver offered $5m to race from the back of the grid around lethally fast 225mph Indy circuit before fatal smash. The headline suggests that Wheldon was the only person to be afforded this opportunity. He was not. This was an open invitation to “the world’s top racing drivers” from the IndyCar president Randy Bernard. Anticipating NASCAR drivers to take the challenge, a clash of calendars meant that no top-line American drivers were available. Dan Wheldon had lost his drive in 2011 and was, ironically, helping in the development of the safer new generation of IndyCar. He’d come back for a one-off race once this season already, sensationally winning the famous Indianapolis 500 for the second time. He’d also won the 2005 IndyCar championship so knew what he was doing when it came to driving these powerful cars. It gets worse ‘inside the paper’. How many races have you seen with 34 competitors where the one who starts last, wins? I’ve never seen such a thing in over 20 years of watching motorsport. Ok, racing drivers are naturally confident sportsmen but even Wheldon was joking about the money on Twitter in the days before the accident. Starting the article with “Father-of-two” is designed to make you think “what a selfish man, leaving his young family”. This isn’t right. Using “pushed himself” is a strange one because what professional sportsman doesn’t push themselves? Promising “pure entertainment” doesn’t mean “I’m going out there to win or die”, as the paper appears to be suggesting. Some good points are made in the article. When I first heard about the race last month, I thought that the circuit may be a bit tight and to put a quick driver with a large incentive at the back might not be the best idea. Although my fears over the track remained, my thoughts over a ‘desperate’ driver were unfounded. A true racing driver goes out to win every time anyway, why would this occasion be any different? I have watched footage of the accident and it’s amazing that no-one else was seriously injured or killed. 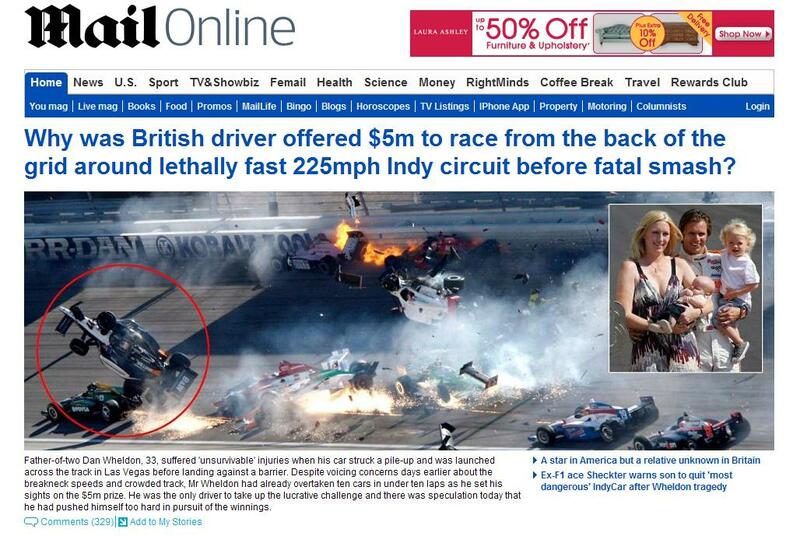 The article makes it pretty clear that it considers the accident to be Wheldon’s fault. You watch it – he’s got a gap in front of him that no other driver appears to have and is caught up in someone elses accident. It took out 15 cars – the only way to have avoided it would have been to be in front of it or not started the race in the first place. I won’t link to the accident, you can search it out for yourself if you so wish.